Hi Annazu fans this is Kim's daughter Mia and I will be posting a lot of things now! My mom will still be posting from time to time but she said that I could mostly write things for Annazu. There will be new posts soon so keep an eye out, also don't forget to watch for MISO! BIG BIG BIG BIG BIG BIG BIG NEWS! Two weeks ago, my husband took our dog Carter to the vet for his second round of Lyme disease vaccines while I was at work. Suddenly I got a text message from him: a very SPECIAL text with a very special picture attached. This picture made me so excited, I responded in a flurry of text messages back to him. My husband responded with more pictures. I then sent him about a million texts back, all with the same message: GET ME THIS! A week later, "this" came to our house. Would you like to see "this?" Would you like to see -- really really REALLY like to see??? 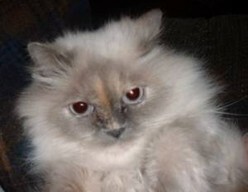 That's right: we have a new kitty -- a new MANCAT ADOPTED-BROTHER HIMALAYAN kitty! Miso was in a cage in the pet food store next door to our vet hosptial, looking for his forever home. His details are unclear, but apparently he had been found as a stray back around August or October, wondering around in someone's yard, with severely matted fur and chronic diarrhea. I guess he stayed at the hospital for all that time as they worked to figure out the cause of his diarrhea. 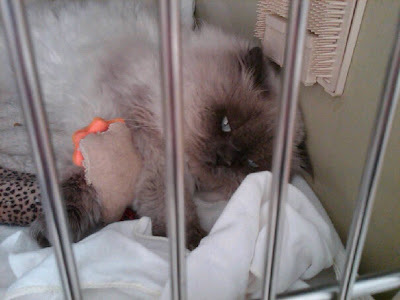 Here he is in his little cage -- poor baby! I had to wait a week to find out if we could adopt him -- my husband put in an application that same day but apparently someone else had an application in ahead of us. Lucky for us, they never returned the hospital's phone calls -- so last Monday, I brought him home to live with US! 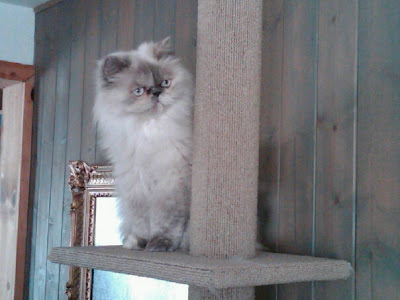 He's a doll-faced Himalayan -- no flatface like Zuzu, more like Anna -- but undoubtedly a Himmie: blue eyes, darky points (I think blue point? 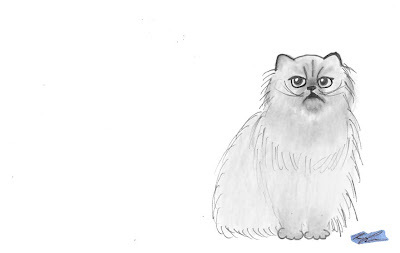 ), chunky fat little body with shorty legs and fluff! Where on earth he came from, I can't imagine -- how could anyone abandon him? Did he get lost? He's only about a year and a half -- poor baby! So far the transitioning period has been going well -- the first few days Anna hissed her head off at him and Zuzu just looked at him like "WHAT THE HECK IS THAT!?" A week and a half later, Zu still avoids him (but watches him with big Zuzu eyes!) and Anna only hissed once today -- when Miso butted into her, in that "pet me" way he has. We're working now on getting him used to Carter -- Carter wants to play very badly, but Miso is "HISSSSSSS, NO DOGGY!" Today, however, they've been staring at each other through the baby gate I have up most of the night with no hissing or barking -- BIG improvement. The hardest part of the transition seems to be getting all kitties on one food: Miso's diarrhea seems to have completely stopped on a special diet of prescription low fat/high protein food. Rather then mess around with what's working for him, I've decided to switch the girls to that, as Anna is prone to diarrhea about twice a month herself (wonder if it's a breed thing?) We have to do this transition very slowly, a little at a time, so as not to upset their tummies! The best thing about Miso Mancat BrotherBoy Kitty is his temperament: he's a big purring loveball, very sweet with the softest meow I ever heard -- softer even than Zuzu's tiny meow! I'll keep you posted -- just wanted to share the news! "I is still very very very prettyZuzu!" One more post for today: once again, Praline continues to inspire! When I saw this post over at Praline's place, I just had to fire up the ol' Photoshopping software! 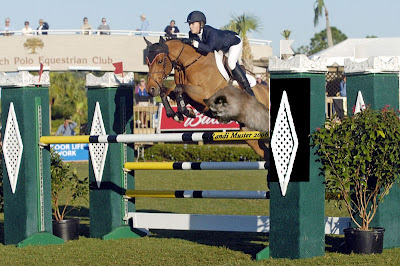 Here's Miss Praline engaging in a little feline/equine show jumping. I have no doubt that she won her class!